You'll be £15.00 closer to your next £10.00 credit when you purchase The Two-Handed Sword. What's this? The two-handed swords found in modern museums are often so large and elaborately decorated that the onlooker might question whether such an apparently impractical weapon could ever have been a serious weapon of war. Yet during the Late Middle Ages, although never numerous, such weapons could instil dread in those that faced them on the battlefield and in skilled hands posed a very real danger, being capable of inflicting fearsome wounds. Neil Melville explains how, from the late-13th century, technological advances made the development of larger swords requiring both hands both possible and desirable. From their origins in Germany he traces their development and divergence into regional variations. He examines the evidence for their use on the battlefield over 300 years, most notably in the hands of the Swiss, the German landsknechts and the Scottish clans, before considering their later use in fencing and as ceremonial weapons. Practical advice on fighting with the two-handed sword is also given, drawing on contemporary fencing manuals. The detailed and informative text is beautifully enhanced by dozens of illustrations. 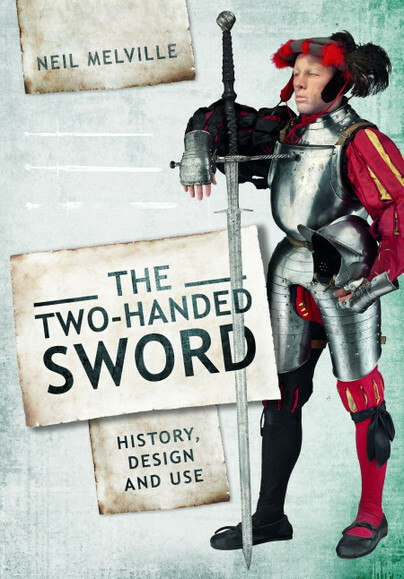 There are lots and lots of pictures of two handed swords and I feel this book is a great addition to anyone’s library who has an interest in big swords. The Book fills an existing gap so far through serious and rigorous analysis. A very interesting book that brings the weapon to life. Neil H T Melville cannot remember a time when he was not fascinated by arms and armour and they have become a lifetime interest. This books is the culmination of many years’ research, in the course of which he has visited most of the major arms collections in Europe. He holds degrees from the universities of St Andrews (Classics) and Strathclyde (Italian) and taught Latin, Greek and Ancient History in state schools in Scotland before retiring to concentrate on the study of arms and armour from the time of ancient Greece to the 19th century, but especially the Middle Ages. Practising what he studies, he is a keen fencer (though with a foil and sabre rather than a two-handed sword!). He is also a long-serving member The Earl of Loudoun's Regiment which re-enacts campaigns of the Civil War and the Jacobite Risings. He has also represented Scotland at fencing. He lives in Stirling Scotland.